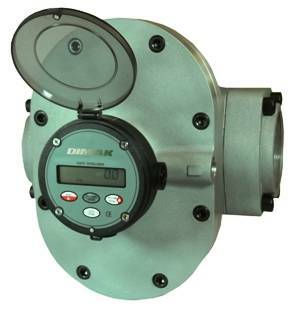 Trimec Flow Products is proud to announce a new range of oval gear flowmeters under the name of Dimak Flow Products. Among the many PD flowmeter design principles available today, the oval gear meter still holds a top place both in simplicity and field proven performance. The inside story reveals a robust positive displacement oval gear flowmeter range incorporating patented innovations and features that bring many benefits to market. Dimak, through Trimec Flow Products, provide a range of oval gear flowmeters which provide high levels of accuracy and repeatability for a wide range of most clean liquids irrespective of viscosity and conductivity, including fuel oils, additives, chemicals, food bases, paints, viscous emulsions, insecticides, alcohol and solvents, either pumped or gravity fed. The Dimak oval gear flowmeters come in size from 4mm to 100mm in aluminium, stainless steel and ductile iron for flow ranges from 0.04 l/h to 1500 l/m.